(Bloomberg) -- Businesses looking for better ways to connect with their customers have helped make shareholders of Twilio Inc. some of the happiest on Wall Street this year. The San Francisco-based cloud software company has soared 148 percent, adding $3.4 billion in market value, for the second-best performance in the Russell 1000 Index after Sarepta Therapeutics Inc. Twilio’s software facilitates communications like text messages and phone calls for more than 50,000 customers, including Nordstrom Inc. and eBay Inc.
Twilio and peers like ServiceNow Inc. are among a cohort of cloud-software companies that have outperformed benchmark indexes in the past few years as business demand erupted. Twilio, which listed shares in June 2016, sees its total addressable market exceeding $1 trillion, according to Hu. The company pulled in $399 million in revenue last year, up 44 percent from a year earlier, with a net loss of $63.7 million. Analysts expect 36 percent revenue growth in 2018, according to an average of estimates compiled by Bloomberg. Like investors, analysts have been largely bullish on the company’s focus on revenue expansion rather than profit. Of 16 analysts covering Twilio on Wall Street, only two have the equivalent of a neutral rating and none recommend selling despite this year’s surge. Short interest has fallen to 6.9 percent of the available float, down from 31 percent a year ago, according to financial analytics firm S3 Partners. But growth hasn’t been seamless. 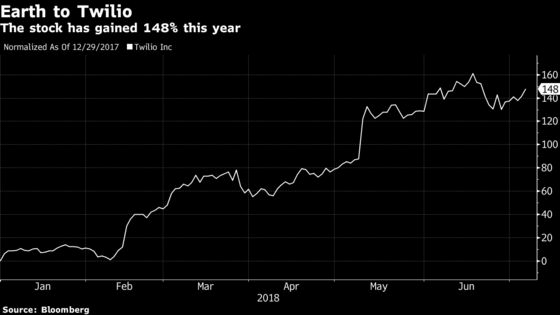 Twilio shares tumbled 26 percent last year in a single day after disclosing that Uber Technologies Inc., its biggest customer at the time, was using competing services. Hu said Twilio’s user base is significantly more diversified now with the largest accounting for a single-digit percentage of revenue. He declined to identify the company’s current top customers. Twilio said last year that Uber accounted for about 12 percent of revenue in the first quarter of 2017, and Facebook Inc.’s WhatsApp accounted for about 5 percent. New products like Flex, a programmable platform for call centers, have pitted Twilio against tech heavyweights such as Cisco Systems Inc. and Amazon.com Inc.
“I don’t think we’ve ever seen as much interest in a new product as we have in the Flex platform,” said Hu, who was chief operating officer at Salesforce Inc. for four years before joining Twilio. “We’re in the very first inning of this technology, which could be adopted by every brand and company in the world,” said Rosenblatt’s Koontz.